This recipe was very close to my heart because Filipinos fry plantains and fry fish, too. It’s always cool to find out that a country so far from the Philippines have the same way of serving an ingredient. 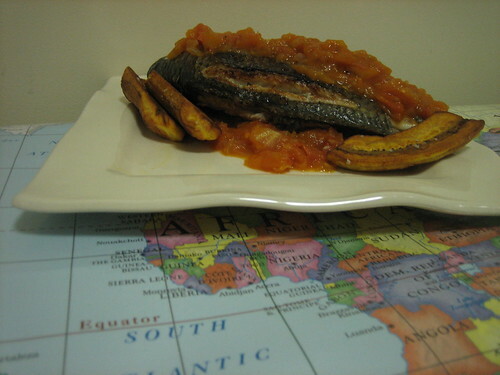 Esther told me that this recipe is a very famous goute, or a small meal eaten between 3 and 6pm, in the Ivory Coast. (That’s merienda to the Filipinos.) Her recipe included one Maggi chicken bouillon but I used homemade chicken stock instead. I grew up with Knorr bouillons in our cupboard and know that it has a lot of salt so I decided to skip it even though the African store in my neighborhood sells them. I wanted the dish to be flavorful without using artifical ingredients. The stock gave the sauce some flavor and at the same time kept it from drying up. In New York City, it’s impossible not to find plantains in any bodega. You can certainly substitute plain bananas but they’ll fall apart when frying, so if you do, try to use the firmer ones. 1. Make the piment d’alloco, or thick, hot tomato sauce. In a saucepan over low fire, heat some oil and sautÃ© onions. Add tomato and simmer until thick, about 20 minutes. Slowly add chicken broth to keep it from drying. Season with salt and red pepper. Set aside. 2. Prepare the alloco. Using a skillet, heat some oil and fry plantains until both sides are lightly browned. Remove to a plate lined with paper towel. 3. Rub salt all over the tilapia. Using the same skillet, fry the fish in hot oil until both sides are golden brown. Serve with the plantains and pour over tomato sauce. This entry is dear to my heart. My Liberian father loves my Filipino mother’s stuffed chicken wings, and my mom can’t get enough of traditionally prepared, West African palm butter. Hi there, I love your recipes! i run a Caribbean food recipe site and was wondering if you mind if i use some of them on my site? They’re not my original recipe, so as all recipe-sharings go, adapt it and make it your own.